Charleston has an endless supply stunningly beautiful and historic hotels and inns. Kathie and I didn’t stay at any of them. We stayed at the imminently practical and inexpensive (for downtown Charleston) Hampton Inn. But if you want to sleep where the youngest signer of the Declaration of Independence slept, the former home of Edward Rutledge is now the Governor’s House Inn. 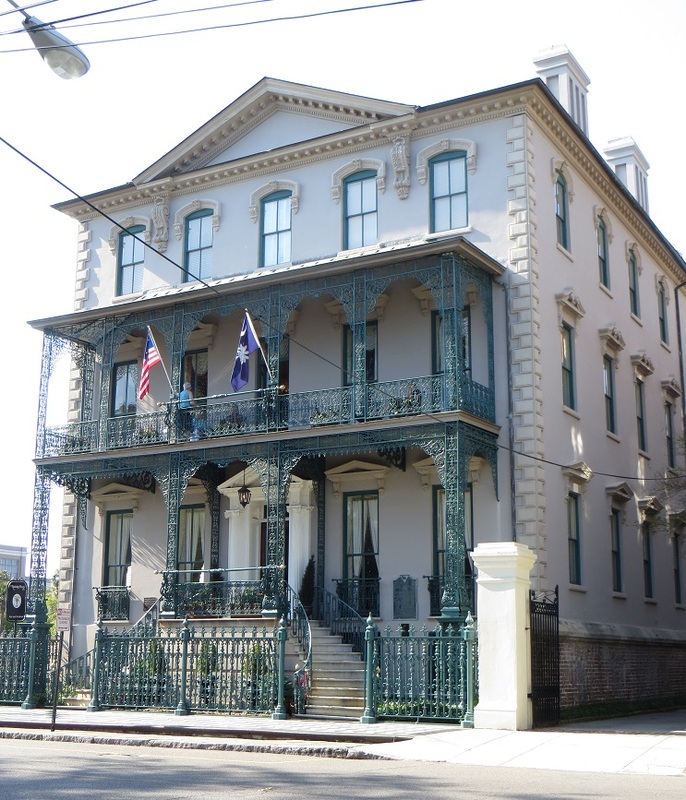 And the house of his brother John, where George Washington “breakfasted with Mrs. Rutledge” (as GW recorded in his diary) is now the John Rutledge House Inn. That’s the John Rutledge House, above. It was much, much lovelier than our stark, institutional accommodation, but also about $600 a night more expensive. Our second morning started the same way that the first did: on the hunt for something that opened before 10. That turned out to be the Charleston Museum which was next to the visitor center, which was across the street from our hotel. The Hampton was nothing if not well-located. 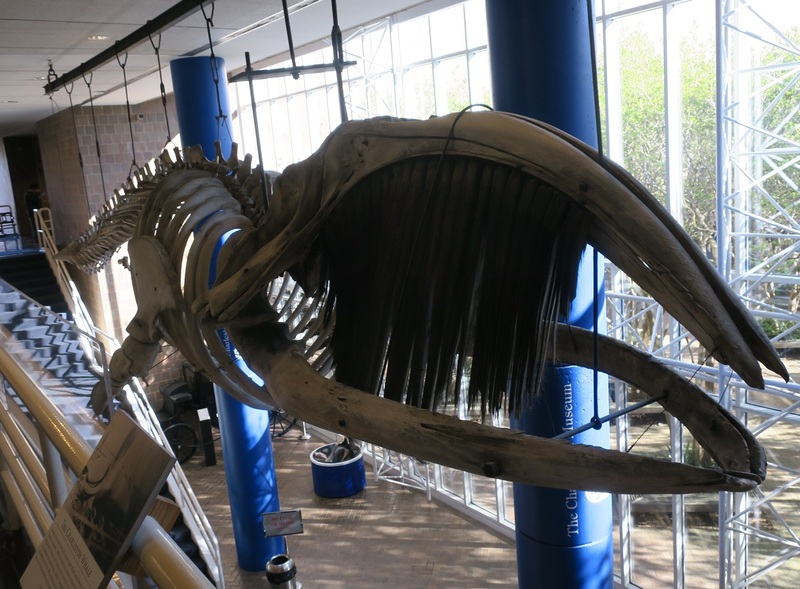 The first object we saw as we entered the museum was the Charleston Whale, which hangs above the reception area of the museum. I’d seen him before — you can’t miss him — but never bothered to read the exhibit label that accompanies him. Now I’m sorry I did, because his is a sad story. He was a 40 foot Atlantic Right Whale who made the mistake of swimming into Charleston Harbor on January 7, 1888, where a flotilla of boats attacked and killed him. The curator of the Charleston Museum at the time reassembled his skeleton and he’s been on display ever since. The Charleston Museum was founded in 1773 and claims to be America’s first museum. It covers everything from natural history to decorative arts. There’s a collection of ancient Egyptian items excavated by various people in the early 20th century which, as we all know from the mummy movies, is asking for trouble. They’ve got one mummy, a young woman. I’m not showing her here, because I have a rule about photographing dead bodies. I don’t. 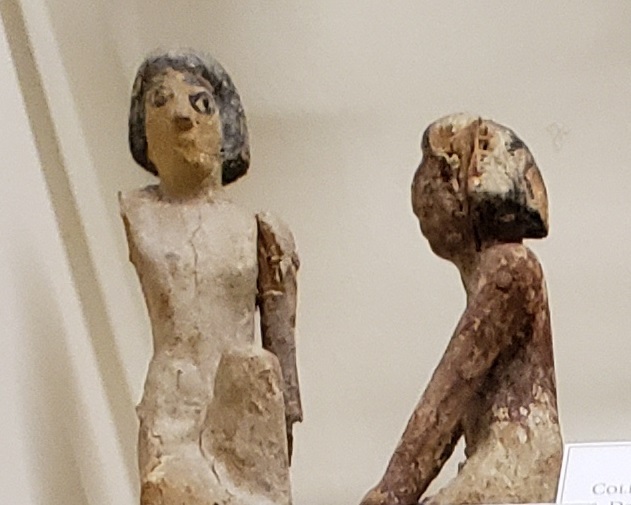 Instead, here are a couple of kneeling wooden figures, 2050-1750 BCE, place of origin unknown. I did once take and post a photograph of a photograph of a dead person (John Paul Jones, if you’re curious), but I’m not sure that I would now. Of course, if you’re a ghost, then show me your best side. Things like this fascinate me: a pair of dentures (1840-1860) — ivory teeth on a gold bridge — excavated from the Heyward Washington House privy. I’m most surprised that someone would throw that much gold down a privy. 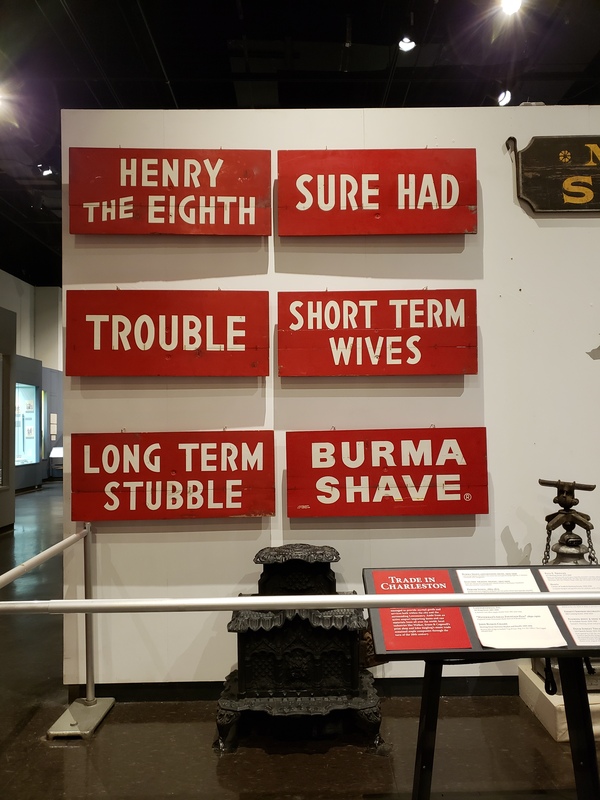 Above is one of my favorite displays, just because it mentions Henry VIII. It’s a circa 1935 advertising sign that stood along the highway outside of Charleston. 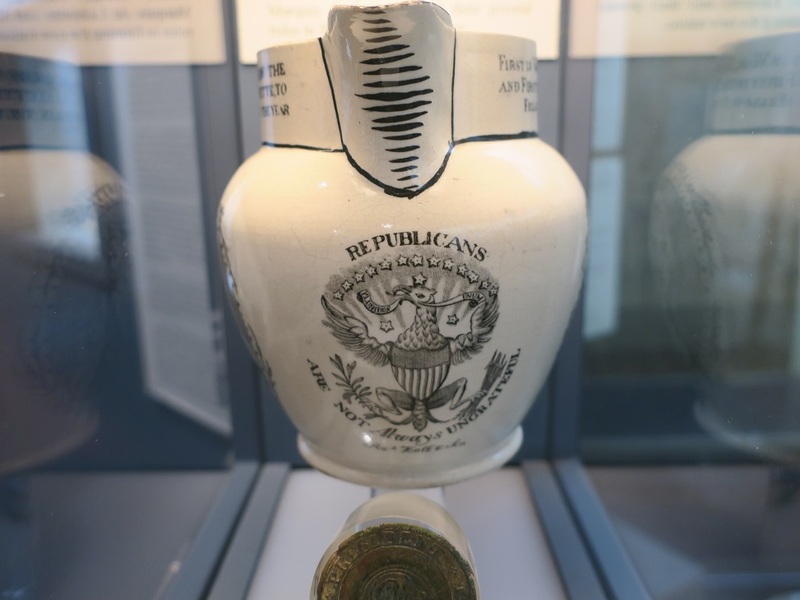 The pitcher was made in 1894, to commemorate Lafayette’s Charleston visit. There’s a rendering of Lafayette on one side and of George Washington on the other. Then on the front: “Republicans are not always ungrateful.” I looked up the phrase and know what it references. But I think it’s more fun to let you use your imagination. Gallery | This entry was posted in South Carolina. Bookmark the permalink.